“I am a person who believes that in order to make an impact on any industry you must set trends, not follow them, and that is the essence of Canvas.” said Wolf. 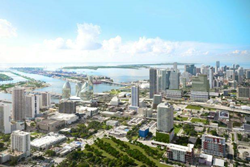 Fortune International Realty, the Miami-based real estate firm led by co-chairman Walter Defortuna, is pleased to announce the selection of Ricardo Wolf as Sales Director for Canvas, a luxury condominium development project located in the Arts & Entertainment District of Greater Downtown Miami. Wolf is a talented real estate professional who brings with him more than two decades of experience in executive sales, marketing, and management. Canvas will feature 513 design-driven residences and 14,000-square-feet of commercial space under air. Layouts include studio, one- and two-bedroom floor plans that offer bay view and city views. Unit sizes range from 620 to 1,110-square-feet. Residential amenities and services, include: two experiential pool decks, accented by wooden benches and lush gardens; an 8,000 square foot gym and spa with yoga garden; fully equipped jam session and sound room for musicians; racquetball court; dog-walking area and concierge lobby with 24-hour security. Prior to joining Fortune International Realty, Wolf served as Sales Director for Prodigy International Development Sales, overseeing efforts for three of the company’s most valuable and successful luxury real estate developments. Wolf is also credited with personally brokering a joint venture agreement between Turnberry Associates, LLC and Beach House Properties, LLC, on The Beach House luxury condominiums development located in Surfside Beach, Florida. He has served as Chief Operations Officer and Broker Associate for Wolf Real Estate Group – a real estate brokerage and development firm founded by the Wolf family in 1970 – since 2008. For more information and sales opportunities at Canvas, contact Ricardo Wolf at Fortune International Realty at 305.570.1800 or visit http://www.canvascondos.com. Since 1983, Fortune International Realty consistently attracts the brightest individuals, selected for their integrity, potential and excellence. Their global network of partnerships and strategic alliances provides their clients with a competitive advantage through far-reaching and responsive support. Fortune International Realty has grown significantly to over 19 offices and 800 dedicated agents throughout South Florida. They remain independently owned and operated, united with one vision to provide experience, excellence and expertise in the luxury real estate market leading to unequaled client service. For more information please visit http://www.fir.com. Founded in 2001, NR Investments is a fully integrated, privately held, real estate investment and management firm headquartered in Miami. The company focuses on commercial and residential real estate assets. NR Investments has acquired more than 7,500 residential units and nearly five million square feet of office space. For more information please visit: http://www.nrinvestments.com.